Truthout.org , August 24, 2018 – This August, the Tunisian General Labour Union, Tunisia’s main labor federation, and Tunisian civil society succeeded in turning back a cargo ship that was seeking to unload its goods in the Tunisian port of Radès. According to the Jerusalem Post, a call then came from Palestinian trade unions, a local Tunisian union and international boycott, divestment and sanctions (BDS) activists to prevent the ship from entering the port. The successful blocking of the ship was a meaningful victory for the boycott, divestment and sanctions movement, which originated in Palestinian civil society in 2005 and asks the international community to cease normal relations with Israeli state institutions until Israel gives the Palestinians the rights due to them according to international law. 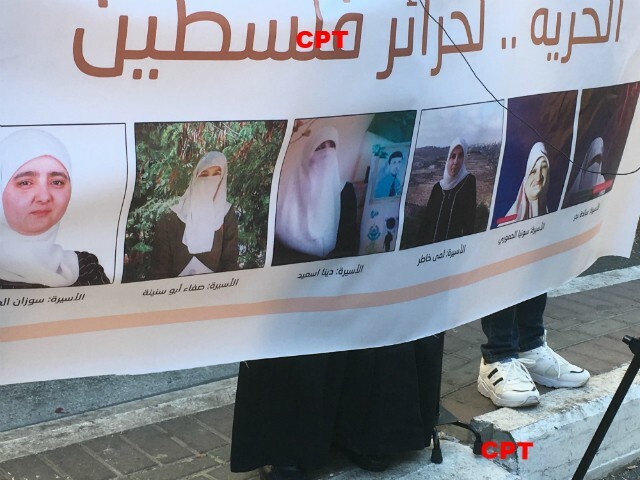 Pictured here: A banner showing the six women who are currently held in administrative detention. On Saturday, August 25th almost 90 people gathered at Ibn Rushd, al-Khalil calling for the release of six local Palestinian women held under Israeli administrative detention. One of the women is a writer and another is a member of the al-Khalil municipality. 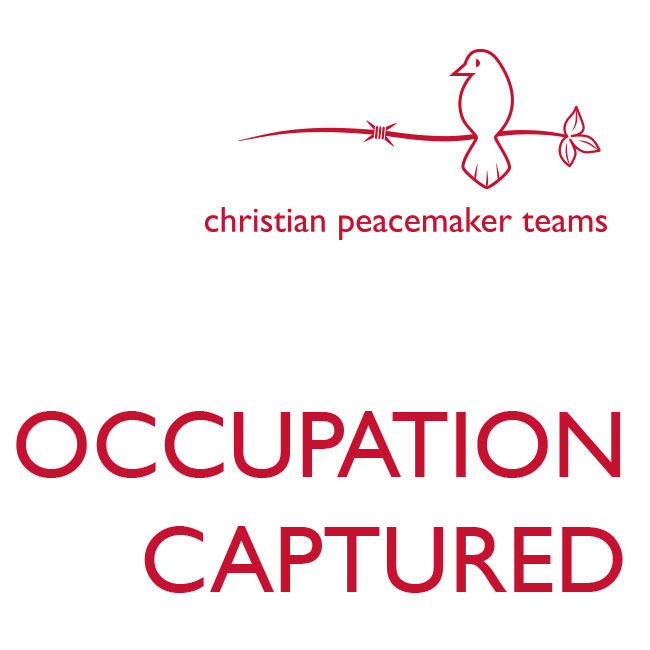 The Israeli military is increasingly targeting local nonviolent activists. The previous night Israeli soldiers conducted raids on two homes, issuing written orders for two people to present themselves at the police station within the large settlement of Gush Etzion more than half an hour away from al-Khalil for interrogation. During this week which includes the International Day of Prayer for Peace on 21 September, church organizations, congregations, and people of faith are encouraged to bear a common witness by participating in worship services, educational events, and acts of support in favour of peace and justice for Israelis and Palestinians. Adam Keller, who spent 50 years working alongside Uri Avnery, remembers the man who hoped for a warm embrace between an Israeli and a Palestinian president. How to sum up in a few words 50 years of political partnership, which was also an intimate friendship, with the person who, I believe, had the most influence on me? The starting point: summer of 1969. A 14-year-old from Tel Aviv, during the summer between elementary school and high school, I notice an ad in HaOlam HaZeh newspaper asking for volunteers at the election headquarters of the “HaOlam Hazeh – Koah Hadash” (“New Power”) party. I went. In a small basement office on Glickson Street, I found three teenagers folding propaganda flyers into envelopes. To this day, the smell of fresh print takes me back to this very moment. Two hours later, we heard a commotion outside. Member of Knesset Uri Avnery, the man whose articles brought us to this office in the first place, walked in. The coffin of veteran peace activist Uri Avnery will be placed tomorrow (Wednesday) between 5-6 pm in Beit Sokolov (Journalists’ Association House) at 4 Kaplan St., Tel Aviv. That is a suitable and worthy location for a man who has made an major contribution to the development of the Israeli press. All who cherish his memory are heartily invited to come and pay their final respects. While prospects for peace seemed to be dwindle in recent years under rightwing Israeli governments, Avnery remained firm in his belief the public could be swayed to support a Palestinian state. AFP, August 20, 2018 – Israeli journalist and peace activist Uri Avnery, who pushed for the creation of a Palestinian state and stoked controversy by meeting Yasser Arafat, has died aged 94, a hospital spokesman said Monday. Seen by many as the backbone of Israel’s peace movement, Avnery never lost hope an agreement could be reached with the Palestinians. Tikkun grieves and mourns the passing of the founder and leader of Israel’s peace movement, Gush Shalom, Uri Avnery. Until the last moment he continued on the way he had traveled all his life. On Saturday, two weeks ago, he collapsed in his home when he was about to leave for the Rabin Square and attend a demonstration against the “Nation State Law”, a few hours after he wrote a sharp article against that law. Gush Shalom grieves and mourns the passing of its founder, Uri Avnery. Until the last moment he continued the way he had traveled all his life. On Saturday, two weeks ago, he collapsed in his home when he was about to leave for the Rabin Square and attend a demonstration against the “Nation State Law”, a few hours after he wrote a sharp article against that law. Avnery devoted himself entirely to the struggle to achieve peace between the State of Israel and the Palestinian people in their independent state, as well as between Israel and the Arab and Muslim World. He did not get to the end of the road, did not live to see peace come about. We – the members of Gush Shalom as well as very many other people who were directly and indirectly influenced by him – will continue his mission and honor his memory. Diary Entry from an ISM Volunteer. Northern Jordan Valley. Shouldn’t you know if you’re going to book a room in an illegal Israeli settlement? Apparently Booking.com doesn’t think so. Days ago Booking.com, bowing to pressure from pro-Israel activists, started describing all of Jerusalem as a “city in Israel” – literally erasing Palestinian East Jerusalem. Booking.com’s CEO Gillian Tans is a proud progressive female leader, famous for her openness – so if we put her personal reputation on the line we can get Booking.com to tell the truth: East Jerusalem is occupied territory.